Too much of a mess! I’m not talented in art. My kids are not interested. We can make lots of excuses for neglecting art appreciation. But why would we skip art when for children it can be such fun and bring joy to the whole family? The key is to have something interesting to share with them and then to have an easy follow-up activity to help build a memory of the picture study in their minds. Do you want to give it a try? Have you heard of the Fauvist painters? Here are some basic facts about the Fauvists, four paintings to view, and some simple to understand instructions to guide you in your art appreciation. Printable instructions are included at the end of this blog entry. The Fauvists were a small group of painters that were colorful and adventuresome. Many people did not like this style of painting from the early 20th Century. In fact, that is where the word fauvism comes from. It means “wild beasts” in French. It is pronounced FOE – vi – zim or you can listen HERE. Henri Matisse and Andre Derain were the leading Fauvist painters and I would love to share four of their paintings with you and your children. Four Fabulous Fauvist Paintings.Printable below! 1. 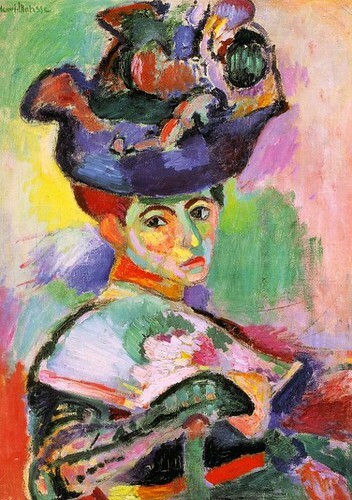 Woman with a Hat by Henri Matisse. 1905. San Francisco Museum of Modern Art. View this wonderfully colorful portrait of a woman in a hat with your children. Have them describe the painting with as much detail as possible. Ask them if they think it is realistic (like real life or did Matisse change things). Can they make up a story to go with the painting? Give the woman a name. What is she thinking or feeling? Use colored pencils or oil pastels to recreate your own woman in a hat. 2. 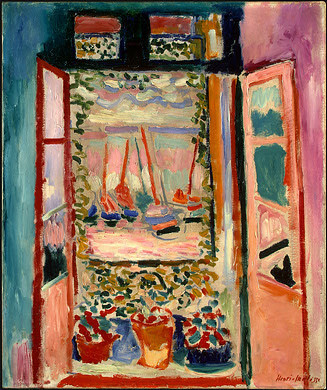 Open Window by Henri Matisse. 1905. National Gallery of Art, Washington, D.C. This painting is such a great way for even the youngest artist to express himself. The easy to identify objects, the colors, and the feeling of this painting make it easy to talk about. View the painting and then give your child a sheet of paper. Have them draw a big rectangle in the middle of the paper just like the window in the painting. Spend a few minutes looking at the view from inside looking out a window in your house. Now have them draw something inside the rectangle, showing what is outside. Finally they can draw the walls, curtains, or furniture that would be on the inside of the window. Remind them to use some Fauvist style by using colors as freely as they wish to express feeling and emotion. 3. 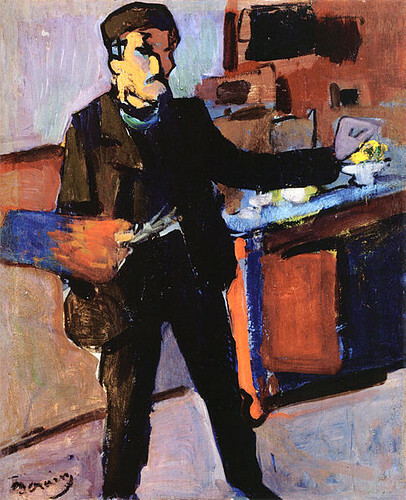 Self Portrait by Andre Derain. 1903. National Gallery of Australia, Sydney. Children love to draw portraits and a self portrait is always fun, especially when you can pick crazy colors and your own setting. Explain what a self portrait is if needed. Spend a few minutes viewing this painting, observing the way that the artist used color to give a certain feel to the painting. How does the artist view himself? Why do you think he painted himself in this setting? Is it realistic? Did he use lots of detail (look at the face and hands)? How did he use black in this painting? If you could title this painting, what would it be? After a period of viewing and narrating, use oil pastels or tempera paints to create a self portrait. Make sure to title your painting! 4. 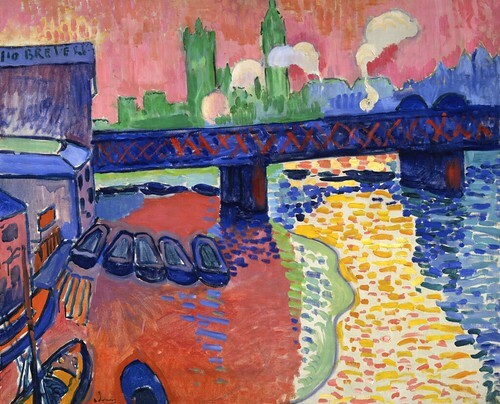 Charing Cross Bridge, London by Andre Derain. 1906. National Gallery of Art, Washington, D.C. Allow time for your children to enjoy this painting by viewing it large online. First have them list colors and then have them list objects. Don’t tell them the name of the painting and have them give it a name. This looks like a marker project so get out all your markers and have your children pull out the colors that they see in this painting and set the rest aside. Give them a large sheet of paper and turn it landscape. If you would like to direct them in this project you can have them use the following sequence: Draw the bridge (horizon), fill in the top with a city-scape, add the water (make sure to use dashes and dabs), and then add a few boats. Don’t forget to fill in the sky. Download the pdf and have it on-hand for an afternoon of art and fun! Each project will be unique and colorful just like a Fauvist! If you like this study, you may wish to check out the Harmony Fine Arts Mini-Units . There are currently three available and they include artist and composer study along with fun follow-up activities. Each mini-unit is no more than $3.95 and is appropriate for children of all ages. Thank you! I’m going to do this with my kiddos today! Hi, Barb. Another great study as always! I’ve been watching a Great Courses lecture series on my own at home and am falling even more deeply in love with ART! We are headed to San Antonio this weekend & hoping to see an exhibit about Japan’s influence on Western Art. There is a great educator’s guide online, too. You might be interested! More info on my blog. Glad you like the Fauvist printable. I had fun pulling it together. What a fantastic Art Study. I love each little lesson and activities! Filed it away for our next year art study, now that we’re finishing off our Impressionists. Thanks! Super cool! Really love this. Ironically, while I have good intentions to work on art with the kids, we seem to skip it a lot. I think I do this because one of my kids really doesn’t like it. I need to not worry about that, and do it anyway. I had no idea what Fauvism was. Personally, I liked the 2nd and 4th pictures the best. This is such a great reminder that I need to do more art with my kids. I shy away from formal art study because I feel like I don’t know enough. I need to have a good look around your site before planning our art for next year. This reminds me of the Impressionists. My daughter and I painted a bridge similar to Monet’s bridge over a pond of water lilies last week, and it was fun to just use our fingers and paint impressions instead of worrying about doing everything just right. I was happy with my finished product which doesn’t usually happen with my attempts at art. This looks like another form I might be able to feel a bit successful in doing. My kids are more artistic than I am, but they like it when I do things alongside them, so I’m glad to have things that don’t require great talent. Thanks for sharing.